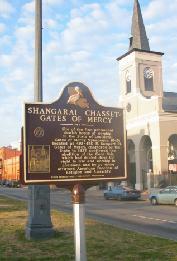 Site of the first permanent Jewish House of Worship in the State of Louisiana, Gates of Mercy Synagogue, 1845; located at 410-420 N. Rampart St.. Gates of Mercy, chartered by the State in 1827, confirmed the abolition of the Code Noir which had denied Jews the right to live and worship in Louisiana and by so doing affirmed American Freedom of Religion and Assembly. 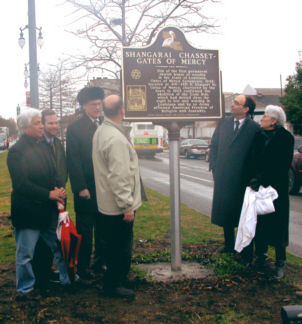 The plaque program was attended by representatives from the State of Louisiana, New Orleans city council and community, Jewish community and Touro Synagogue. Present are Jerry Klinger of JASHP, Rabbi David Goldstein of Touro Synagogue, President Louis Good and members of the community. In the early 1900's Gates of Mercy merged with New Orlean's Touro Synaogue making it in turn the oldest continually functioning Jewish House of Worship in Louisiana. 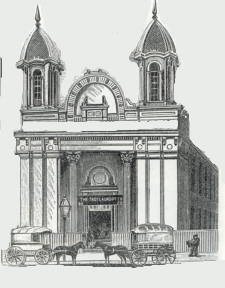 The original synagogue was located in a modified blacksmith shop. The congregation was of very modest means. It was many years of hard work and effort before Gates of Mercy was able to build a very respectable structure.